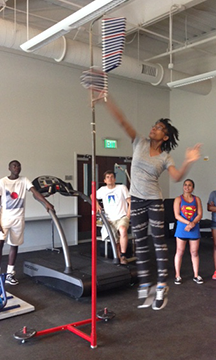 During the second week of June, the School of Kinesiology hosted 25 high school students at its first-ever Sports Science Camp. The students came to the Auburn campus from Alabama, Georgia, Florida, Arkansas, and Washington, D.C. 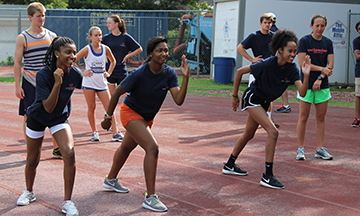 Directed by Kristin Roberts, the Sports Science Camp was conducted by faculty and staff from the School of Kinesiology in the College of Education. Its purpose was to allow rising 9th through 12th graders interested in the fields of exercise science, physical activity, and sport performance to see how these disciplines work at a top-rated program like Auburn’s. Students were also able to visit the MRI facility in the Auburn Research Park, and tour the new Student Rec Center. They stayed at Broun Hall and ate their meals at various campus dining facilities. The students also engaged in a speed and agility session with Drs. Gretchen Oliver and Wendy Weimar. They learned proper running form and quick starts. The biggest hit of the camp was introducing the students to team handball. Another popular activity was yoga with Dr. Danielle Wadsworth Wednesday morning, and a seminar on Mindfulness with doctoral student Ford Dyke. The campers were also able to see health and fitness assessments in the School’s TigerFit program, led by Mynor Rodriguez. “We also had three other on-campus camps send their students to us for various activities,” Roberts said. “We did team handball with the Loachapoka Explores Auburn Days (LEAD) Camp and the 21st Century Community Learning Centers Camp, both of which are run by the Truman Pierce Institute in the College of Education. The LEAD session was conducted by Sarah Gascon and Jence Rhoads, both Ph.D students of Dr. Oliver’s, and USA Women’s National Team players. 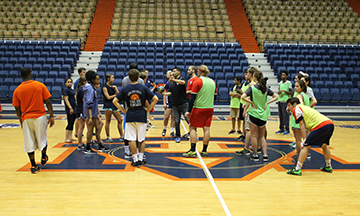 The Community Learning Centers Camp session was conducted by players from the Auburn University Team Handball Club. The third group was the Black Belt Legacy Camp which brought 52 middle schoolers from West Alabama to Auburn for the week. They toured the Kinesiology Building with Roberts, and did a physical activity with Dr. Alice Buchanan at the Coliseum. A very similar Sports Science Camp will be held in July for Junior High students. 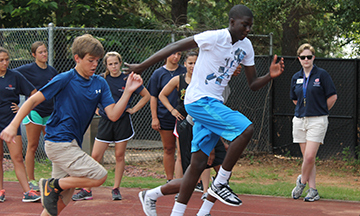 Visit the Auburn Youth Programs website to learn more about the Sports Science Camp.